When you acquired your first chameleon, how long was it before you heard something from someone about calcium? Hopefully, you learned quickly that calcium needs to be fed to chameleons kept in typical captive conditions in the US. From one view, calcium is simple. A mineral that cannot deteriorate with time, heat, or light, calcium is widely available and easy to give. From other views, however, calcium is complex. Calcium cannot be dealt with in just one column, so we'll return to the topic several times until you're comfortable with the wide variety of calcium salts marketed today, dosing schedules for your chameleons, and pitfalls of calcium supplementation. Calcium is a mineral or element found in the earth. Chameleons cannot manufacture their own calcium, so all that they need (calcium makes up about 2% of their body weight) comes from food. Even the calcium they absorb from eggshell as embryos originated from the dam's diet. About 99% of a chameleon's calcium is found in its bones and teeth. In these structures, calcium forms a hard matrix with phosphorus and certain proteins, providing a rigid framework (endoskeleton). Bone also serves as a storehouse for extra calcium. When thinking of calcium, we tend to think of bone. But the 1% of body calcium found outside of bone is essential for the life of your chameleon. This 1% controls heartbeat, nerve transmission, muscle contraction, blood clotting, and enzyme activation. Because these functions are so critically important to life, calcium is removed from bone when needed to maintain normal levels in cells. Indeed, bone is a dynamic mover of calcium, and throughout each day calcium is moving into and out of bone in order to regulate cell levels and blood levels of calcium. This shuttling of calcium around the body is under the control of many hormones. Let's say we've just coated a couple of crickets with calcium carbonate and have fed them to a chameleon. What happens next? The calcium will travel down the esophagus and through the stomach, into the small intestine. Here, in the acid milieu of the upper small intestine, some of the calcium will be absorbed and some will continue down through the intestines and exit in feces. We don't know how much calcium will be absorbed by our chameleon. Some animal species absorb only what they need, and the extra calcium is passed out in feces. Others absorb the extra calcium and excrete it in feces and urine via the biliary (gall bladder) and urinary systems. A few species absorb all of the calcium from the diet and excrete the excess in urine only. We don't have hard data for chameleons, but because of necropsy findings in biliary and urinary systems and clinical findings during feeding trials, it appears that chameleons absorb some but not all dietary calcium, regulate absorption based on many factors (see the list at the end of the article), and excrete calcium. In addition to species' differences in calcium metabolism, day-to-day differences affect the mineral too. When a chameleon is low on calcium, more will be absorbed from the diet. When body calcium is ample, less will be absorbed from diet. When dietary calcium is in excess, relatively less will be absorbed. Sudden increases in dietary fat lower calcium absorption, as do dietary fibers, plant phytates and oxalates. Acid from the stomach that enters the small intestine facilitates calcium absorption. Excess acid in diets that is excreted in urine leads to excessive losses of calcium. Vitamin D3 is essential for one form of calcium absorption; and estrogen helps maintain body calcium. Stress and old age lower calcium absorption. Calcium Transit Systems - Throughout all of these day-to-day variations, the shuttling of calcium into and out of bone continues. Rates change according to needs, and the goal is to maintain blood calcium levels within normal limits. This control over blood calcium is essential to maintenance of life, and it is the reason that measurements of blood calcium rarely give us useful information. Blood calcium levels decrease only when the elaborate control mechanisms can no longer function. In future columns we'll cover the different forms of blood calcium and how certain advanced tests can help your chameleon. If dietary calcium is low, more calcium is released from bone in order to maintain adequate blood and cell levels for the life-preserving maintenance of heartbeat, nerve transmission, and muscle contractions. If this one-way flow out of bone continues for a long enough time, bone weakens. Then the classic signs of calcium deficiency are seen - bone fractures and deformities such as wrinkled casques in veiled chameleons (Chamaeleo calyptratus) and shortened, bowed bones in the lower jaw (mandible). This bone disorder is one of a family of diseases termed metabolic bone disease (MBD). The form of MBD specifically related to dietary calcium deficiency is termed nutritional secondary hyperparathyroidism, NSHP. We'll cover lots more on these problems in future columns. Occasionally, the shuttle system fails to keep up with sudden, drastic fluxes in calcium. Then, there is a major risk of calcium plummeting in blood and cells, and life-threatening low blood calcium (hypocalcemia). Early signs of hypocalcemia can be seen as defects in nerve transmission and muscle contractions. 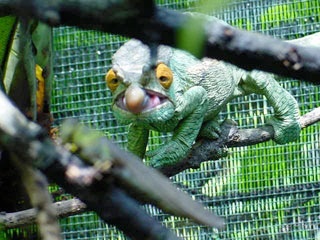 These chameleons display tongue projection problems when feeding and weak toe grasp. Another form of hypocalcemia may occur in female chameleons when their eggs pass through the shell gland. Although hard data are lacking, it appears that the sudden need for calcium uptake by the shell gland is too great or too fast for an adequate response by bone. This form of hypocalcemia can kill quickly. Knowing the long list of factors affecting calcium uptake and excretion provides clues to different responses by chameleons in various situations. Chameleons can adapt, within limits, to low calcium intakes by increasing absorption and decreasing excretion. They can appear to be in buoyant health for their entire lives, or can crash suddenly if something upsets the delicate calcium balance. A good example is seen with wild-caught chameleons. Wild chameleons - Generally, the calcium intakes for wild chameleons are lower than those seen for chameleons in captivity. Their calcium may be limited, but it is highly available and much more is absorbed than what is likely typical for captive chameleons. Moreover, their metabolism has adapted so they maintain adequate blood and cell levels with only modest calcium stores. 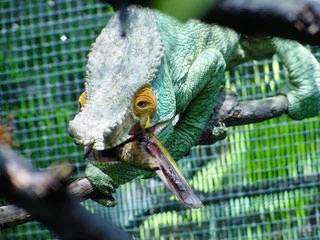 Wild chameleons, however, that have been captured, transported and held for a while with limited food or water may develop life-threatening hypocalcemia. Stress from capture lowers calcium absorption and also lowers the hormones necessary for calcium metabolism. Low food and water intakes slow gut motility, further decreasing calcium absorption. Calcium excretion may increase with stress, predisposing the chameleon to hypocalcemia. We're currently adding calcium to our oral rehydration solutions (ORS) for wild-caught chameleons, and are pleased with the results. From one breeder to another - One everlasting observation, as true today as in the earlier decades of chameleon keeping, is the too-frequent inability to successfully transfer husbandry techniques, including recipes for calcium supplementation. One breeder will use a specific form of calcium or schedule for supplementation very successfully, yet it fails in the hands of others. The failure is usually due to one of two scenarios: (1) the myriad of factors affecting calcium balance are not identical in the two systems; or (2) the chameleons kept successfully are models of adaptation. Examples of this latter scenario include breeders that rely on direct sunlight only for all needed vitamin D3, and breeders that rely on specific prey (and diets for prey) only for all needed calcium. What succeeds in South Florida rarely works in Maine. Moreover, differences in calcium systems have been noted between species, blood-lines within species, and more. Much of the difference relates to metabolic rate. Chameleons use calcium according to their metabolic rate. Thus lowland species tend to require more calcium than montane species because they are maintained at warmer temperatures and have higher metabolic rates. Faster growing chameleons need more calcium than slow growers. Females with larger egg mass require more calcium than barren females or low producers. Because of calcium's dependence upon energy, requirements are based on calories: xyz mg calcium per calorie of metabolizable energy, abbreviated as xyz mg Ca/kcal. As calorie intakes increase, so should calcium intakes. In future columns you'll learn how to determine the right amount of calcium for your chameleon husbandry, and how to adjust supplementation based on calorie intakes. Back to the chameleon we just fed. Now we know that some but not all of the calcium on the cricket will be absorbed. We know that if we had applied that calcium to a wax worm (higher in fat) less calcium might have been absorbed. We know the calcium will travel to bone and then move on to cells and blood, helping to keep our chameleon alive. We also figured out that if our chameleon has been underfed calcium, we won't see any telltale signs until late in the disease process. We know that veileds and panthers eat more calories, hence need more calcium, than montane species such as Jackson's and rudis. And we've learned that our husbandry produces variations in hormones such vitamin D3, estrogen, cortisol which in turn regulate calcium balance. More to follow in future columns. These juvenile Chamaeleo deremensis are growing at different rates. The different growth rates reflect differences in daily calorie needs and metabolic rates. As a result, their calcium needs vary also. The larger chameleon on the left will eat more calories and need more calcium than the smaller chameleon on the right. •Function of digestive, biliary, renal, urinary and endocrine systems.